Content by Tony Macklin. Originally published on October 29, 2014 @ tonymacklin.net. Birdman is molted and motley. It coos and screeches. It's one of those films that keeps prattling about the truth, but it deals with it falsely. It smacks of pretension throughout. It reminds me of the political ads on television that use the words "honesty" and "integrity." When it's almost a sure guarantee that the candidate doesn't have any. Truth is not contrived. Birdman is. Its concept is basic, and it treats it with breathless obviousness. It's like religion. It struts with a superiority complex. Birdman is the story of Riggan Thomson (Michael Keaton), who gained fame playing superhero Birdman on the screen. He has gone through a long arid period since he turned down making a 4th Birdman movie. Riggan has written a play, adapted from a Raymond Carver short story, "What We Talk About When We Talk About Love." Of course he changes the ending of the story and makes it more dramatic, but who will know? Who reads? Riggan also is directing and starring in the play. He is not in his natural habitat. Just before preview performances, Riggan has the other leading actor fired. He is replaced by Mike Shiner (Edward Norton), who is an accomplished, powerful stage actor. Shiner shines and gets a shiner. Oh, boy. Birdman offers a conflict between screen and stage, as well as the various states of illusion. It's not exactly untilled territory. So it tosses social media into the bird seed. Director/writer Alejandro G. Inarritu is like Robert Altman without Altman's ease. He's clumsy where Altman had a naturalness. Altman would have made Birdman without having to rig it so much. One might compare Birdman to Altman's Brewster McCloud (1970). Birdman will be much more popular, but Brewster McCloud is a more original film. Altman also channeled Raymond Carver's short stories in Short Cuts (1993), which served Carver well. Inarritu trashes Carver. Riggan's daughter Sam (Emma Stone) dismisses his work as just for "rich, old, white people." Yeah, old, white people that admire subtle art. Inarritu and his three writers - Nicolas Giacobone, Alexander Dinelaris, Jr., and Armando Bo - had lost me long before they feebly mocked the leading theater critric in New York (Lindsay Duncan). She says she hasn't seen the play but is going to "kill" it in her review. It might have made more sense to attack someone like Pauline Kael or even James Agee. I doubt whether Inarritu and his scribblers have ever been told by anyone that he or she is going to kill their work without seeing it. And, of course, to continue the cheap absurdity, the reviewer ultimately writes a rave review of Birdman. What a bunch of truth that is. The writing is obvious and sporadic. Birdman has three or four endings. It's all over the place, stopping and starting like a New York City taxi cab. Jake, the producer (Zach Galifianakis) says Marty Scorsese is casting a new film, and he mispronounces his name as "Scorsaz." It would be better to pronounce it as "Scorsāse," as most people incorrectly pronounce it. But if it were subtle and actual, then people wouldn't get it. Jake also threatens to expose another character who likes pictures of "nuns in diapers." Audience members actually laugh. The wit won't quit. The soundtrack is extremely busy. The drums and cymbals keep pulsating like a false heart. The symbols crash. The cast members enthusiastically throw themselves into their parts with abandon, since they almost demand overacting. Michael Keaton is impressive as the neurotic, moody actor, and Norton has his moments as the willful, egotistical actor. Emma Stone uses wide eyes to effect as the psychologically-wounded daughter. She holds up her end. Naomi Watts and Amy Ryan bring their talent to the labored goings-on. Birdman should really appeal to those who loved Eternal Sunshine of the Spotless Mind (2004). I'm sure the film society - to which I belong - will love it. Birdman is a virtuoso hodgepodge. 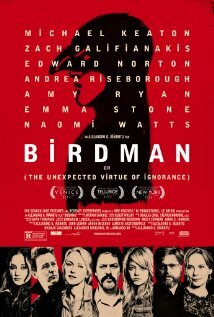 The subtitle of Birdman is "or (The Unexpected Virtue of Ignorance)." Which is kind of an announcement that it will be dumbed down. Once again, truth takes wing and disappears. In Birdman, ignorance goes viral.